Monday and Tuesday, January 28 and 29, members from four congregations converged on the World Evangelism Building in Winona, MS. Two from one congregation returned to their homes Monday evening, but four sisters in Christ from two other congregations lodged overnight with Paula Bates as well as with Bonnie and me. 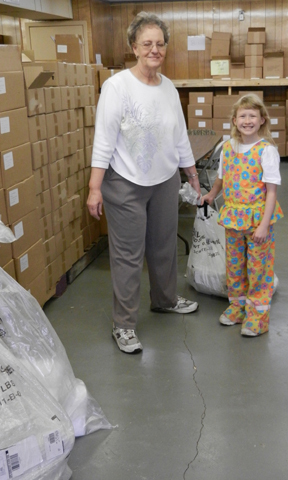 They continued working at the office/warehouse on Tuesday, and they were joined by members from the fourth church. The mission was to package and mail packets containing the latest issue of Global Harvest and The Voice of Truth International magazines plus tract samples. Envelopes were stamped with the indicia, stuffed, sealed, banded together and sacked. 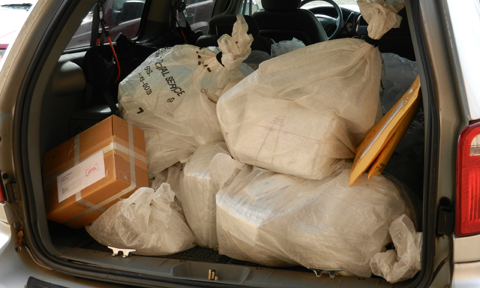 I hauled four loads of sacks plus other packages to be shipped to the local Post Office over those two days. 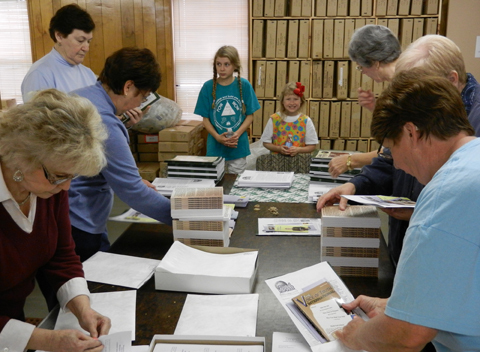 Altogether, about 2,500 packets were prepared and shipped. We only have about 4,500 to go! There is a lot of behind the scenes preparation that prefaces the foregoing mentioned activity. Mailing lists need manipulated, and labels must be printed. Letters that identify the contents and explain the purpose of the mailing must be composed and printed. Meals must be planned, and groceries have to be purchased. Materials need to be acquired. Beds need to be made – before use and after use by guests. Other projects must be curtailed or simply ignored while visitors are on site to help us. 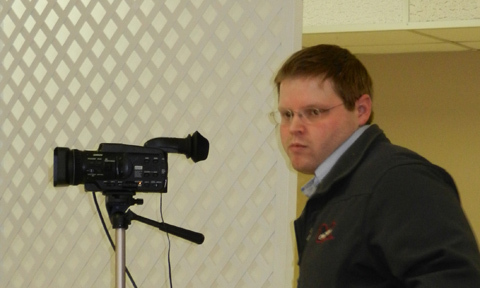 There are two benefits in particular from groups of brethren coming to Winona to help us from time to time. Sometimes the mission is mailing preparations, while sometimes the chores are varied to include general cleaning, maintenance, assembling or building shelving, etc. One benefit to we who labor daily in Winona, of course, is the added help to accomplish more quickly a project such as a mailing or to perform some of the necessary functions that the five of us normally here cannot do while keeping everything else going. Secondly, it is good for brethren to see what goes on in some of the work that goes forth from the World Evangelism Building to promote evangelism throughout the world. Brethren can have a better sense of belonging and ownership or partnership with one another in the cause of Christ. In addition, guest worker – volunteers – are a great encouragement to us both in the working fellowship and in undergirding our morale to keep on keeping on. In any case, Thank You! Saturday, January 26, 2013 found us arising earlier than we might have otherwise so that we could attend the annual Delta Enrichment Seminar. 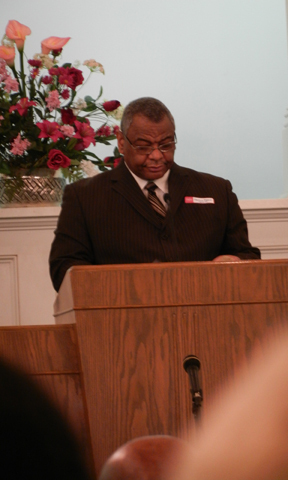 This year, it was hosted by the West President Church of Christ in Greenwood, MS. The theme, “Allowing God to Answer Our Challenges,” was ably address by three speakers in four sessions from 8:45 a.m. to about 12:30 p.m. Tim McCarter from the Cleveland, MS Church of Christ led off the program and did an outstanding job of presenting his lesson about “Challenges of Worldliness in Our Lives.” He was followed by Harold Redd from the Midtown Church of Christ in Memphis, TN; he also concluded the program later. 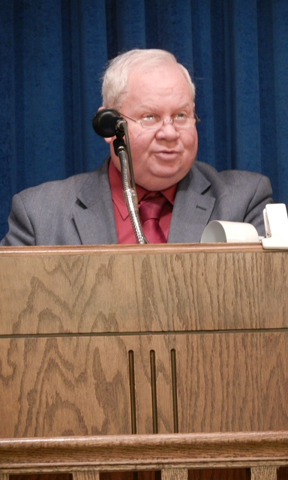 Respectively, he preached “Challenges in the Church” and “Challenges of Faith and Commitment.” The third lesson addressed “Challenges in the Family,” and it was delivered by Michael Bates from the Batesville, MS Church of Christ. Following the program, all who stayed afterward enjoyed a sumptuous lunch of barbequed, pulled pork sandwiches, barbequed beans, coleslaw, chips and desserts. Brother McCarter’s sermon alone, besides all the other good teaching and fellowship, certainly was worth getting out of bed early on a Saturday morning. 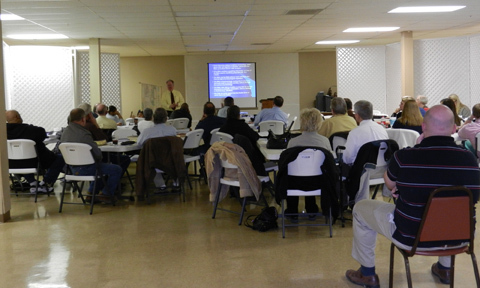 Next year, the Delta Enrichment Seminar will be conducted by the Cleveland, MS Church of Christ. Before we made our way from home in Winona, MS to Greenwood for the seminar, we had to pack an overnight bag. You see, upon leaving Greenwood we angled the car northeastwardly toward Grenada, MS to intersect Interstate 55 north. Our next venue was to be in Crockett, MS for the opening of the 43rd year of the Training School for Better Service under the direction of Robert Rawson. This program provides a combination of classroom and Internet resources for brethren to improve their knowledge and skills in Christian service. Some teenage young men first read Scripture, preached and led hymns. Around 6 p.m., it was my turn to present a sermon under the theme of “Challenges Facing the Church Today.” After noting several different directions a lesson could take by either addressing challenges from within or from without of the Lord’s church, I spoke about the seriousness of embracing the mission of the church that Jesus Christ assigned to it (“What Is the Mission of the Church?”). In addition to those present, the lesson will be added to numerous webpages on a variety of subjects to which one can turn via a computer connection to the Internet. Visit www.tsfbs3-edu.com for more information. Following the program, everyone enjoyed cake and ice cream. Robert Rawson, his wife and sister-in-law as well as Bonnie and me made the short jaunt to Senatobia, MS for a late supper. Bonnie and I resided overnight in a local motel so we could attend Bible class and worship in the morning with the Crockett, MS Church of Christ. For class, I showed my PowerPoint about 2012 Mission Trips, and for worship, I preached Worshipping Almighty God Acceptably and with Godly Fear. Once more, brother Robert Rawson as well as his wife and sister-in-law treated Bonnie and me to a fine meal before we returned to Winona, MS. On the way home, we stopped at Wal-Mart in Grenada, MS to pick up some groceries to prepare a meal for visitors coming Monday to the office/warehouse to help prepare a mailing of Global Harvest magazine. Sunday evening, we dropped in on the West President Street Church of Christ for worship since I did not have an appointment anywhere. Hence, we enjoyed another weekend on the road, howbeit, we did not travel as far and we were not out as late Sunday night as often is the case. Truck, Truck, Here Comes the Truck – Again! Friday, January 25, 2013 another tractor trailer pulled up to the World Evangelism Building in Winona, MS – just three days after another one earlier this week. This time, we only had one pallet of 5,000 books to unload. Unlike Tuesday, today there was no lift gate, and so we had to unload the boxes of books one at a time from the bed of the trailer. Of course, today it was raining – lightly. No problem! It did not take long for Bonnie, Paula Bates and me to unload the truck and put the boxes in the hole between other titles on pallets in the warehouse. 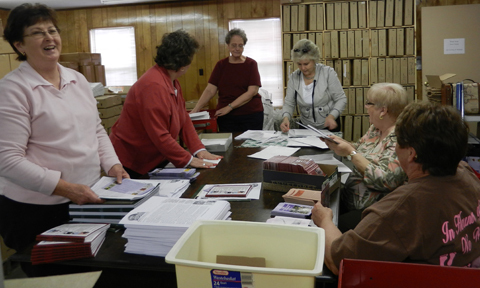 Before the truck’s arrival and during the unloading process, several sisters in Christ from the Huntsville Church of Christ outside of French Camp, MS helped prepare a future mailing. They were preparing a mailing of the Global Harvest magazine, which only arrived Tuesday on the earlier truck this week. The Global Harvest magazine is published twice annually, and it chronicles in text and color photos mission work occurring around the world through the churches of Christ. Drop me an email at rushmore@gospelgazette.com if you would like information on how to obtain a copy for yourself. Comments: Comments Off on Truck, Truck, Here Comes the Truck – Again! 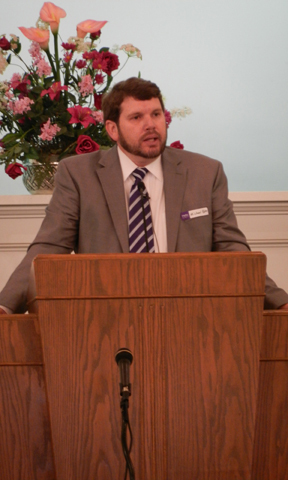 Thursday, January 24, 2013 was session #2 for the Mississippi School of Biblical Studies, hosted by the Siwell Road Church of Christ in Jackson, MS. 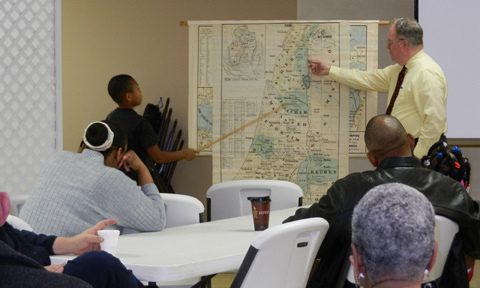 I taught Bible Geography, after which Gary Hampton taught Biblical Interpretation. Bible schools abroad have proven to be key to the edification of brethren and equipping them to reach out to their countrymen with Christianity. Likewise, schools such as this one can also be “for the equipping of the saints for the work of ministry, for the edifying of the body of Christ” (Ephesians 4:12 NKJV). All comers are welcome. Please plan on being present from 6 p.m. to 9 p.m. each Thursday evening if you can on the lower level of the meetinghouse of the Siwell Road Church of Christ at 4075 Siwell Road, Jackson, MS. Alternatively, you can watch the classes live over the Internet or even view past classes, too. Simply click “View Live Service” on the toolbar of the webpage for the Siwell Road Church of Christ at http://www.siwellroad.com/. See you there! Our truck due Friday of last week finally arrived Tuesday. Five pallets totaling 5,406 pounds came about a quarter to one in the afternoon. On board were Global Harvest magazines and tracts – all the way from Hong Kong. A backorder of 5,000 of my tract, The One True Church of the Bible, will be shipped out Wednesday. That is the single most popular tract among the 80 or so tracts that we publish at World Evangelism, and it has been translated into 13 foreign languages, too. Another truck is scheduled to pull up to our doors on Friday of this week, bearing a book that is printed in Taylor, SC. On hand to help unload today’s delivery were a father and son – Rafael and Isaac Barrantes – who work with us in the Spanish aspect of the World Evangelism ministry. Originally from Costa Rica, Rafael is the Editor of the Spanish edition of The Voice of Truth International, and Isaac is a student at Freed Hardeman University. 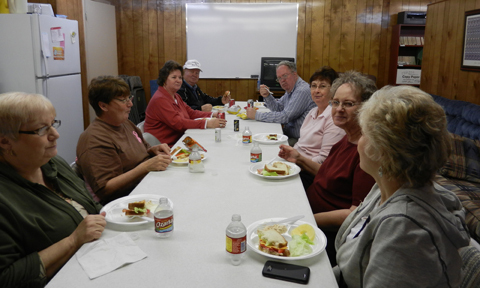 They were in town to talk about the work, and while we were all having lunch, the truck came. In addition, Barbara Oliver from across the street, who formerly worked with World Evangelism and who does mission work in Costa Rica was invited to lunch. So, we had Paula Bates (Jerry is away in India), Betty Choate, the Barrantes, and Bonnie and me on hand today. We were unsuccessful in encouraging any of our visitors to return on Friday for the next truck! Saturday, January 19, Bonnie and I launched out to Arkansas (from Rebecca’s home in Collierville, TN where we had lodged Friday and Saturday nights). We were the guests Saturday evening of Melissa and Garry Polk of Center Ridge, AR. He is one of the elders of the Center Ridge Church of Christ where I spoke Sunday morning for the Bible class and worship hours. As always, we received a kind and friendly welcome from the members. I made the 2012 Mission Trips PowerPoint presentation in class and preached What Is the Mission of the Church? in the next hour. After being treated to lunch at a Mexican restaurant, Bonnie and I headed toward our next appointment – also in Arkansas. Sunday evening, I made the same PowerPoint presentation about missions to the Southside Church of Christ near Batesville, AR. It is a pleasure to visit these brethren every opportunity we have. From there, we headed back to Rebecca’s home for the night. Both congregations visited on Sunday in Arkansas participated with us financially so that we can take the Gospel abroad. Not Bonnie because of recent illness, but I leave for Guyana, South America on February 7, 2013. Before returning to Winona, MS, Bonnie, Rebecca and I did a little repair work on her home. It is incomplete, and at an unspecified time in the future and when we can squeeze a few moments out of our schedules we will continue some small repairs. At Grenada, MS some 20 miles north of Winona, Bonnie and I bought some groceries before dragging into 705 Devine Street, Winona, MS. We made the obligatory after dark grocery run on the way back to Winona from a weekend of appointments – this time in Arkansas. 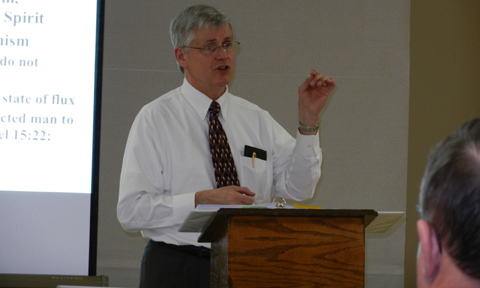 Tags: 2012 Mission Trips, What Is the Mission of the Church? Thursday evening, January 17, 2013, the Siwell Rd. 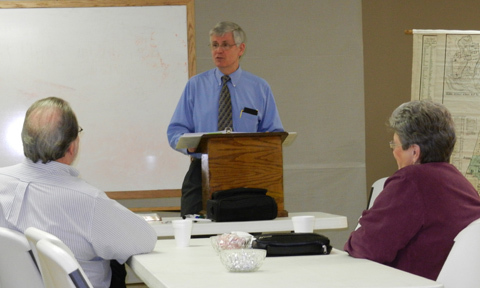 Church of Christ in Jackson, MS hosted the first session of the Mississippi School of Biblical Studies. It is patterned after the long successful Nashville Bible School, and Gary Hampton is its Director. It was my pleasure to kick off this new endeavor with a class for an hour and twenty minutes on “Bible Geography.” Gary Hampton taught the second class of the evening about “Hermeneutics” or biblical interpretation. Over 40 attended. This series of classes will go on for eight weeks. 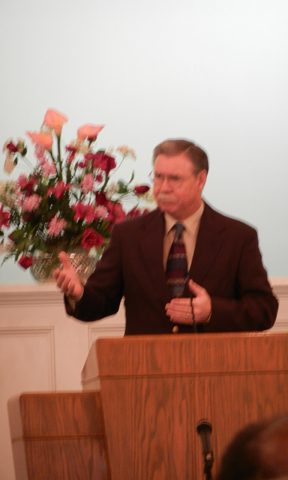 For more information about the Siwell Road Church of Christ, go to its webpage at http://www.siwellroad.com/. You can even go to resources on the toolbar of the page to find the archived videos of last night’s classes.